You can read more of my writing over at the Meeple Like Us blog. You can some information about my research interests over at my personal homepage. … those same sites keep telling me that sharing on social media is just as valuable as financial support, but none of them tell me why that is and how that works. So you’re either all telling fibs and being polite (because physical monies are evidently more tangible), or holding out on why my support via sharing on social media can be so beneficial? I’m not on FB, but… they CHARGE you to push content to your own SUBSCRIBERS? Is this really what you are implying? If so I’m mind-boggled by the incredible dominant position FB acquired to be able to pull it off. And you know what? These lead to what I think is a great topic for a special feature. Let’s do another behind the scenes – this time looking into the grubby and uncomfortable world of self-promotion, word of mouth and advertising. Note here I’m going to talk about word of mouth in a nakedly quantified way – how it relates to traffic. The benefits these has for credibility, the fun of the job, and social proofing for publishers are too big a topic to include in here, even though they’re arguably far more important to the success of a site. Maybe that’s a topic for another post if people would be interested. 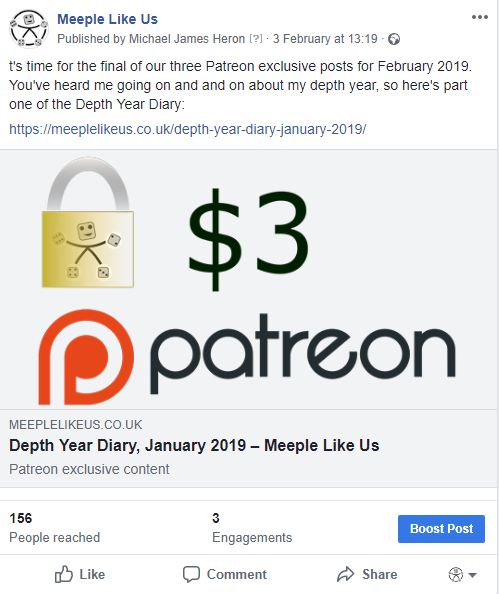 By far the largest single monthly expense we have on Meeple Like Us is Facebook ads, and that probably seems weird to a lot of people. After all, we have a healthy number of likes on our Facebook page – 1260ish, which while small beans in the grand scheme of things is good for a small outlet like ours. We have a similarly healthy number of Twitter followers – a touch under 4420 at the time of writing. These aren’t Wil Wheaton levels of following but it’s certainly nothing about which we should feel bad. With those modest but respectable levels of social media support, it seems like advertising wouldn’t really be needed. 1000 True Fans and all that. If everyone that liked the site enough to follow it read every post we published, we’d be rolling in views. That alone would give us the better part of three-quarter of a million hits in a year. We’ll probably actually manage maybe 260,000 in our third year of operation. The problem is that social media numbers don’t measure our ‘fandom’, such as it is. They measure passive interest. They are people who, presumably, like the cut of our jib but aren’t going to take a bullet for us or anything. Of the likes and followers an account has, only a small proportion of them will check out everything you do. Some of them won’t check out anything you do. Not everything is going to be of interest to every person. Some people just decide they don’t want to read what you’ve written because they have other reasons for following your account. That’s natural and completely understandable, but the thing is that Facebook as a platform takes away the ability of people to make that decision for themselves. Only a small proportion of those following a Facebook page will even be told that you’ve put up a new status update. The rest simply won’t see your updates in their feed, and the longer they go without interacting with you the less likely they are to see anything you post. 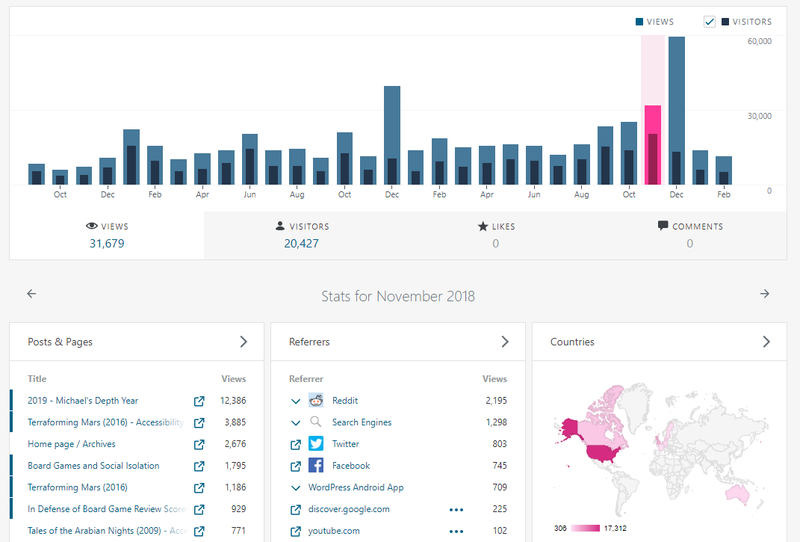 A Facebook page gets a fair amount of analytic information sent its way, so I went through our posts for the past few months to grab some figures. I tend to pay for $5 of ads for every ‘mainline’ post for the site and not boost anything that is locked, or from a third party, or of niche interest. Here’s the last post I didn’t ‘boost’ because it seems aggressively in-your-face to boost locked posts. Of our 1260 subscribers, only 156 of them were shown the post and only 3 of them engaged with it. By ‘engaged’ Facebook means they mean clicked on the status update or followed the link. You can probably Ignore the engagement rate here though – the post is clearly marked as locked content and people generally will not click on stuff they know they can’t access. The ‘people reached’ figure though – that’s our ‘organic reach’ of non-boosted posts. Maybe though it’s just because we prominently marked it as Patreon content? Maybe Facebook doesn’t want people being spammed with crowd-funding links? Maybe Facebook is the good guy in this scenario. Luckily, I have a control post! 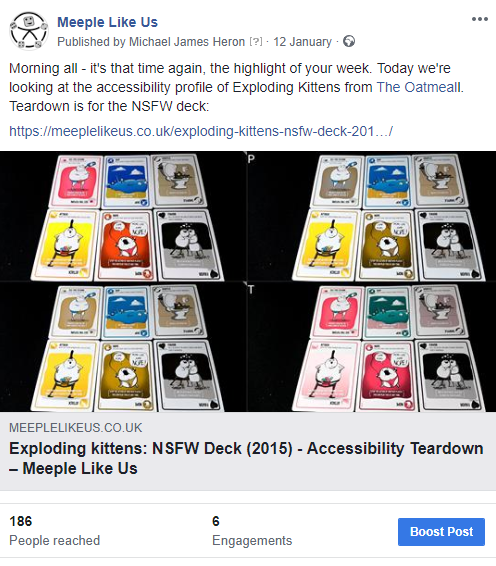 Our accessibility teardown of Exploding kittens (the NSFW deck) also didn’t get boosted but only because Facebook doesn’t let you boost NSFW content. You’ll see though a similar story – 186 people reached, although with twice as much engagement. Maybe though the problem here is that it’s a NSFW post? Oh wow, you’re good. You’re really on the ball with alternate hypotheses. Here’s a second control post which has everything going in its favour – not locked, not NSFW, and not even from our site. 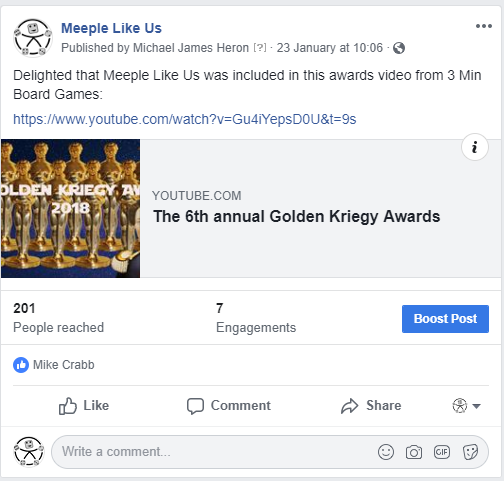 Facebook penalises the visibility of links that go to the same domains over and over again, and most of our links are obviously to our own content. Indeed, Facebook is pretty keen for people to not leave the social network at all and penalises external links generally. They want you staying where your eyeballs can see their adverts. This one reached 201 people, and got seven engagements. You can see that the engagement rate of non-locked content is about twice that of locked content, but the organic reach of all of them is considerably less than our subscriber numbers would imply. What happens then if you do boost a post? Quite a bit as it happens. 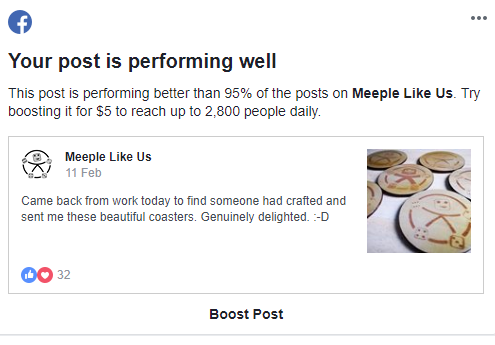 $5 of boosting gets a reach of 1066, 79 engagements and 47 link clicks (which are better for us than ‘engagement’, which mostly benefits Facebook), and twelve reactions. That’s what $5 of advertising on Facebook gets – access to a healthier proportion of our subscribers. The adverts we serve go to ‘people that like your page and their friends’ – Facebook is still, even with payment, not letting me talk to the all the people that actually made the effort to subscribe to the site. If we went to people that liked the page alone, we’d get maybe half that reach. We only get to serve our status updates to a proportion of the people that presumably wanted to see them. More money gets a bigger slice of the audience that signed up to your work. In fact, Facebook will often quite brazenly point out that it’s withholding visibility until you cough up. That post, with its 32 reactions, has currently reached 408 people. I didn’t boost it, but engagement drove its visibility a bit higher. Your likes, your comments, and especially you shares – they all give a little nudge upwards in the algorithms. Even passive engagement is good for us even if it’s only in the area of tens of people as opposed to hundreds. Notice though that Facebook is constantly reminding me that all it takes is a bit of money and they’ll generously let more people see the content they signed up to see? Nice followers you have there. Shame if anything happened to them. That’s why we spend around $5 per post then – that’s the basic ‘access with menaces’ funding model Facebook has implemented. We all signed up willingly. We all entered the prison by choice. Then it turned out that the guards at the gate wouldn’t let us have the packages anyone sent from the outside unless they came along with the greasing of some digital palms. You’re all basically being held to ransom until I send cash to break you out of the big house. I guess we should just be thankful they’re not sending me your thumbs in the mail. Now, it’s not that there aren’t alternatives to Facebook. Old fashioned mailing lists don’t suffer from these problems but in my experience people simply don’t sign up for them unless you basically force them with aggressive and over-the-top pop-ups. I’m not going to do that to you. The result of not doing that though is that after almost three years we have a total of 60 email subscribers. We have about 120 people following us on Feedly. Those aren’t numbers that can remotely compare to what $5 of Facebook ads can buy even if those ads won’t necessarily convince anyone to click and read what we’ve written. We pay $5 a post to give people that choice. Seriously though, if you want what we do reliably sent your way, sign up for our mailing list (link is in the sidebar to your right) or sub to us on your RSS reader of choice. Or subscribe to our own subreddit where everything gets syndicated. The more that happens, the less control Facebook would exert on our daily successes or failure. On Twitter it’s a different story. We use the account as a blend of ‘personal observations’ and ‘advertising new content’ and unsurprisingly the latter doesn’t get a huge amount of engagement. I wouldn’t be surprised if a non-trivial proportion of our followers have us muted for that reason – sometimes it’s just less awkward to mute someone loud that you otherwise bear no malice towards. I’ve done it to plenty of people. I certainly wouldn’t bear a grudge if they did similarly. Likewise, some of the previous positions I have taken up in regard to the rotating carousel of ‘issue of the day’ performative outrage has lost me a lot of support over the years. That’s really neither here nor there. I point it out just to show that my experience on Twitter is not necessarily representative. There are dozens of people who can turn smaller follower counts into reliable virality. That’s just not us. I think we’d do better on Twitter if we were a site run by someone nicer, let’s just put it that way. Anything below the Board Game Geek line is too situational to matter. Also, because we weren’t using HTTPS for a long time the BoardGameGeek figure of 719 is much lower than it actually is. Don’t worry why – techy stuff. What you can see here is that Facebook with 22,854 views is a better traffic source for us than Twitter at 13,802. Twitter though is free. We pay for no adverts there. That’s all organic traffic. What you can see very clearly though is that Reddit is a larger traffic source than Facebook and Twitter put together. We have a handful of actual fans of the work we do that post some of our content to Reddit on a semi-regular basis. I can’t over-emphasise how much of a difference that makes to the site. This is also another area where silent support can be invaluable. The difference between a submission reaching the top versus being downvoted off the front page and into irrelevance can be a single upvote at the right time. There’s a Matthew Effect in Reddit success – highly rated posts get even more visibility and thus attract even more votes which gives them even more visibility. Sometimes a submission though just doesn’t take – I see a lot of our content atop the controversial tab of Reddit on a regular basis and what that means is there’s a war between upvotes and downvotes. We are not necessarily popular over there. Some days I find out we made it onto Reddit and I never would have been able to tell just looking at the site stats alone. Our Depth Year post in November for example got over 12,000 hits and a big chunk of that was from Reddit. December was a great month too, but for a slightly different reason – our Top Ten was picked up by the Google recommender system and got served to thousands of people as a result. The Reddit thread about it only got us a couple of hundred visits in comparison, but I think its presence on Reddit was what alerted the recommender in the first place. I base that purely on the otherwise suspicious serendipity of the timing. So, what does this trip through the stats mean in terms of answering the question about word of mouth? Well, look at what the stats say: Advertising is an okay source of traffic, but it’s not a patch on people actually sharing the work you do. The problem is that a small creator like Meeple Like Us has to engage constantly in self-promotion. It’s not a comfortable position in which to be. Assume only 10% of your True Fans are comfortable in sharing your work. Assume only 1% of your audience is made up of true fans. With 1000 people in your audience, that means 10 true fans and only one of them is going to share the work you do. With 100,000 people in your audience you get 100 people sharing and that creates a critical mass where content can go viral. You can tweak these parameters of course, but the simple fact is that large audiences have a much greater impact than small audiences. Lacking that, a creator must be their own most evangelized true fan. Unfortunately to paraphrase Tim Clare on Twitter, ‘I’m a shill for Big Michael’. I’m not an authentic voice of support for the site. I’m a vested interest. I’m the least trustworthy source you have for why you should read anything we do. Let’s look at that referrer chart again. Of the top ten sources we have for traffic, paid advertisements come in at #3. Reddit shares are by far our largest single source of social traffic (but it’s not actually where most of our traffic comes from). Twitter is #4 and I don’t pay a penny for advertising there. If I didn’t pay for Facebook ads I imagine Facebook would fall to just above Stumbleupon, and that’s pretty bad given how Stumbleupon is a dead platform. 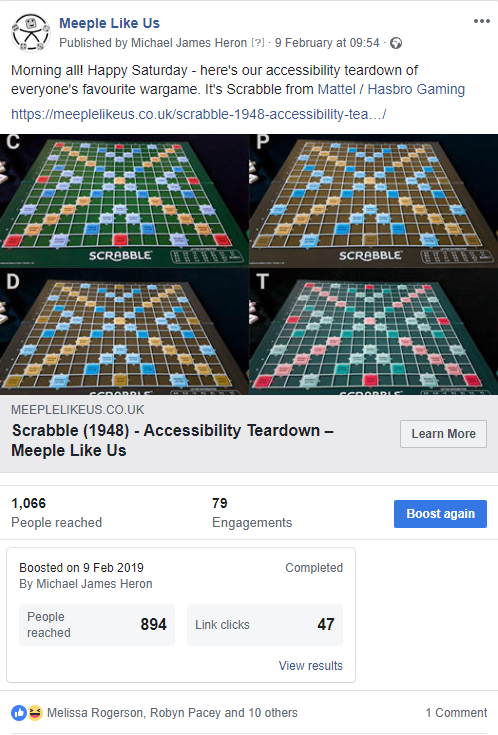 It wouldn’t really take much for Twitter to overtake Facebook as a source of traffic for us – a few more retweets, a bit more general engagement, followers casually dropping the site into conversation when the topic veers into game accessibility. All of that sends notable amounts of traffic our way. It’s not necessarily a lot in any individual case but it rapidly mounts up in the aggregate. For search engine traffic, do you know what drives visibility in the algorithm? It’s word of mouth again. It’s sites linking to us (with dofollow attributes) to show that they trust the content we provide. Any time someone links to the site it’s an endorsement, and the algorithms know this. The traffic that a link directly sends our way is often secondary to the long-term impact it has on where we end up when people search on Google. Word of Mouth, as expressed through web links, impacts positively on our page authority and our domain authority. It’s not transparent as to how, and it’s not always positive, but it’s an important element of how we get ranked in searches. It’s why we always provide a dofollow link when we reference something. We’re trying to help, in our own small way. Reddit traffic is entirely word of mouth. Reddit is incredibly hostile towards promotion of any kind, but especially self-promotion. We are phenomenally lucky to have people that occasionally share our work over there and you can see for yourself the impact it has on our visibility. A single good Reddit post can send more traffic our way than a whole month worth of Facebook ads. If someone made a single MLU submission a month to Reddit they’d be worth the weight of a $50 Patron, at least in terms of what they’re enabling in terms of equivalent ‘ad spend’. Of course, nothing is ever this easy and I absolutely don’t want people spamming Reddit with our content. People get tired of seeing our logo and they react accordingly. But you know – sometimes what we do might be worth, in your opinion, sharing with a larger audience . If you see that we’ve done something especially interesting, or you think it’s particularly worth discussing, and you happen to be a regular contributor to Reddit in your own right… well. If you honestly think it’s something people should see, then I’m very happy when I see such links make their way on to /r/boardgames. Reddit forbids people shilling for upvotes on submissions but if you ever see us tweeting a Reddit link to something that was posted, and you think it’s something of worth, well… you’d be amazed at how much an upvote can make a difference. It’s important to note here that none of this even comes close to measuring the importance or impact of a site. Quantification is a tricky topic – we tend to value what we can measure rather than measure what we should value. If we can put a number on a thing, it instantly acquires a worth by virtue of fitting into the analytical tools that are shoved into our faces. Traffic is easily measured, and so it is easily desired. The obvious question then that follows is – okay, so we can get traffic but is traffic really the thing that what we want? The answer of course is ‘no’, but what we want is a byproduct of traffic. What we want are readers that value the work we do. 1 engaged reader is worth 10 indifferent lookey-lous. One True Fan of our work is worth 1000 spite-clickers. Simply driving people to Meeple Like Us means we get a lot of traffic but few of those visitors become regulars. They click and say ‘Oh, right’ and then forget about us forever. That does us no good at all. However, sometimes large amounts of traffic are what it needs for those future regulars to find us. Sure, maybe only 1% of the people visiting the site ever come back but if that’s 1% of 100 hits we still got a new and interested reader. That’s worth its weight in gold. There’s a reason why my publisher doesn’t quote me on the front of my books. ‘”The best words EVER” – TIM CLARE’ would not be a convincing inducement to buy. Your retweet is absolutely invaluable. It might not reach thousands of people but the people it does reach are going to be swayed by your authentic seal of approval. 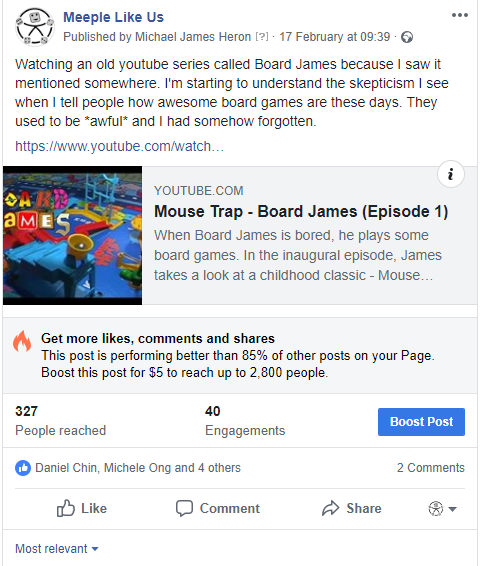 Your Facebook share might not go to a legion of people that will descend on the site, but I’m willing to bet the conversion rate of ‘passer by’ to ‘interested party’ is much, much higher than my own self-promotion can get. Maybe your Reddit submission didn’t make it into the top ten, but you know who tends to like board-game websites? It’s board-gamers. Do you know who tends to keep coming back to board-game websites? Yeah. You know who likes to have just the right site to recommend when someone asks a question like ‘What game should I get for my colour blind uncle’? Yep. There are two parts of the ‘growth’ equation that need to be taken into account. One is the traffic itself, the other is what we might think of as the ‘retention rate’ or ‘attach rate’ or whatever corporate gobbledygook you favour. 1000 people at a 1% attach rate versus 100 people with a 10% attach rate – at the end, they do the site the same amount of lasting good. 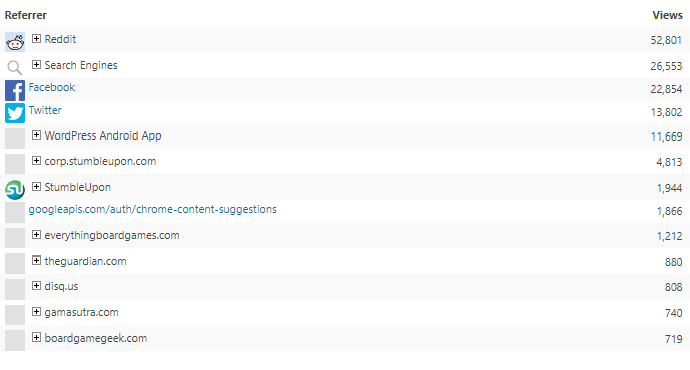 You can see Stumbleupon in our referrer chart above – that was awful traffic. There was quite a lot of it but pretty much everyone that came our way via Stumbleupon danced off into the sunset without a bye your leave. Word of mouth on the other hand generates high quality traffic. The kind of traffic a site would kill for. The kind of traffic a site would pay for. I know – I’m already paying for it. I’ve said many times for those that can’t afford to pledge on Patreon that there are many other ways to support the site if you think the work we do is valuable. Money is tangible, yes. It pays for bills and keeps the servers running. Word of mouth though is what makes a site thrive. Word of mouth is what keeps the people behind the site going. Are you finding these behind the scenes posts interesting? Do you have a topic you’d like to see explored as a continuation of this ad-hoc series? Let me know!